ST sport suspension kits feature perfectly matched springs and dampers to ensure the best possible handling once installed. The pre-set damping is not only set per vehicle, but also the intended level of lowering (for example 20mm or 30mm). Each kit features a low friction and pressure resistant housing with a high-quality mono block guide and seal package for maximum longevity. Once installed, you can expect your car to handle more agile with reduced body roll under hard driving conditions, not to mention a sportier lowered look. ST sport suspension kits are designed to work alongside the OEM components and are built to the absolute highest standard. Every ST sport suspension kit is built to meet German TÜV standards to be used on a wide range of vehicle brands. These include German makes such as VW, BMW and Audi as well as more niche brands including Chrysler and Volvo. ST sport suspension is available on 30 vehicle brands in total. 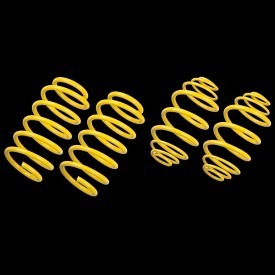 Already fitted lowering springs? Further improve your vehicle’s driving dynamics with the ST sport shock – an OEM replacement that will transform the way your car feels and handles! ST sport shocks are manufacturerd with heat-resistant twin-tube dampers with fixed damping characteristics. Their low friction and pressure resistant housing features a high-quality mono block guide and seal package for maximum longevity in ALL weather conditions. What’s more, a shortened chrome-plated piston rod makes the sport shock perfectly suited for lowered vehicles. 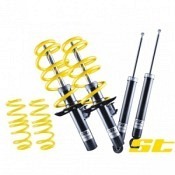 The use of high quality components ensures each ST sport shock performs at its best for the maximum period of time. 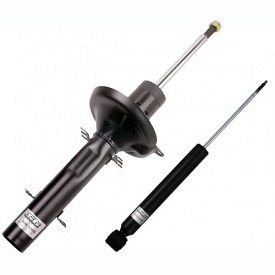 The use of a shortened piston rod ensures a sufficient pre-load of the lowering spring under hard driving conditions. 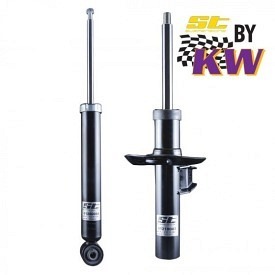 With their fixed damper characteristics, the ST sport shocks ensure a greater driving experience for numerous cars.